A new brand, a new client and a new travel retail product! 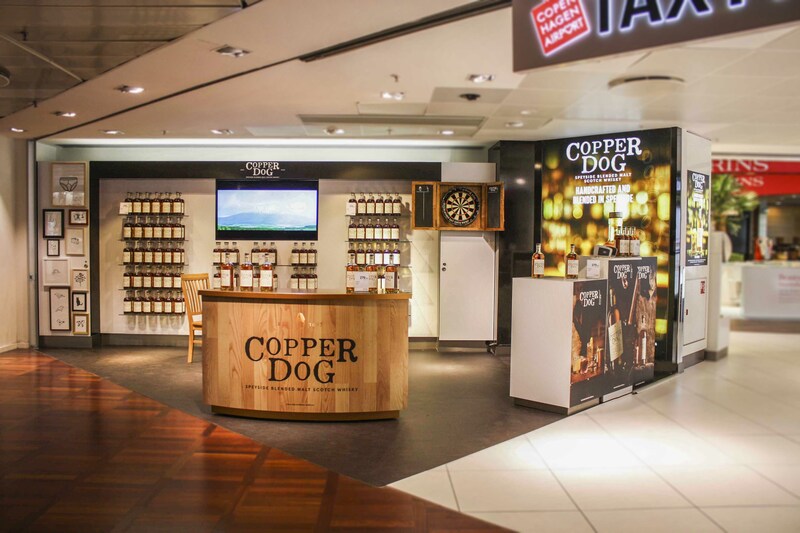 Copper Dog has launched its travel retail campaign in Copenhagen Kastrup International Airport with a fantastic shortcut stage in the departures terminal of the airport. Exclusively to Heinemann Duty Free. The promotional space in Kastrup International Airport belongs to Heinemann whom Copper Dog have started their cooperation with this year. At roughly 15 square meters it is a nice spacious start for Copper Dogs first TR promotion. With the help of our clients feedback we designed the activation mostly from scratch. Sourcing the bar unit, table and chairs to replicate the atmosphere of a Pub. We also dressed the walls and till unit and applied the vinyl graphics on the walls and floor. We covered the light box on the right-hand side with a large Duratrans film to show the Copper Dog imagery. Copper Dog is a scotch whisky with a very interesting name, concept and blend. The name itself comes from the name given by old distillery workers to their trusty hidden pipe which they would use to help themselves to a dram. The idea for copper dog was born at the Craigellachie Hotel located in the heart of Speyside whisky country. The late 19th century hotel’s pub was a popular one among local distillery workers and highland travellers who used to share tales of their copper dogs and smuggling. These stories were the inspiration for the pubs name, Copper Dog and instigated the creation of a whisky of the same name. Copper Dog aims to bring whisky to the pub lover and to give Britain a spirit brand that lives up to the other great creative exports of the island including art, film, fashion and music. The whisky itself features no less than eight single malt whiskies blended together. Before being married in Speyside for a further 3 months in re-fill casks. Resulting in notes of: toffee apple, berries, citrus, apple & pears and spice. Recommended for people who love a good pub, Copper Dog is recommended to be consumed however you want be that as a shot alongside a cold beer, with soda or cola or just straight.